Seacrest Beach Lagoon Pool in Back Yard + FREE BEACH TRAM SERVICE! This newly remodeled two story luxury home awaits you at the beautiful beach of the Emerald Coast. 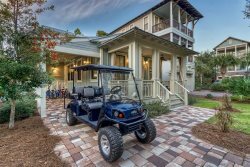 Located in the popular Seacrest Beach Community, "Emerald Escape" sits behind the large, resort style lagoon pool where you can walk out the back patio door to the pool or take a 5 minute walk to the beach! Tile floors lead the way into the kitchen, dining, and living room areas. Remodeled, the large open kitchen boasts granite counters, new stainless appliances, cabinets, and tile back splash. The kitchen opens up into a dining area with seating for 6 and extra space for seating at the bar. Surrounding windows allow plenty of natural light to show off the new tile floors throughout the first floor. The bright and large living area has comfortable seating and a large flat screen Smart TV. French doors open up to amazing view of the green area and lagoon pool. The first floor has a Queen bed in one room and a built in twin over full bunk in the other. Both have TVs, closets, and dressers for ample storage space. A full size bath with tile floors and new walk in shower is also located on the first floor. The second floor features an amazing master king size bedroom with a balcony that overlooks the green space and pool. Couch (sofa sleeper) and large flat screen TV adds extra space for kicking back and relaxing. Many windows brighten this great room, and the adjoining masterbath has been completely renovated featuring a double vanity, free standing soaker tub, and large walk in shower. The kids will love the bunk room with 2 sets of twin over twin bunk beds, bean bags, TV, and private access to a balcony. The other bedroom has a Queen size bed with dresser, armoire, TV, and private access to the balcony. The newly remodeled bathroom hass a walk in shower with glass doors and tile floors. The outdoor living space features comfortable resort seating, a small bistro table and a new gas grill. Perfect for relaxing while the kids play in the large green space directly behind the house. This house is just steps away from the pool and beach, great views and plenty of space to enjoy your vacation! Will was great, very responsive and easy to work with. We had a great time in seacrest, looking forward to our next trip! Lisa was very pleasant and great to work with! Our stay was wonderful, including the weather, and perfect for our group! We enjoyed the back patio and cooking on the grill with a nice view of the pool. Our daily bike rides were very enjoyable and we were able to explore lots of areas...realizing Seacrest was our favorite! We will be back again. Thanks for the great accommodations!